New in macOS Sierra and iOS 10 is a Universal Clipboard feature that makes it much easier to transfer links, text, photos, and more between different devices. With Universal Clipboard, you can copy something on your Mac and paste it on your iPhone, or vice versa. It's already been possible to open up web pages across multiple devices, but now that functionality has been extended further. With macOS Sierra and iOS 10, when you copy a link on one device, it's uploaded to iCloud and available on all other devices where you're signed in with your Apple ID. You can do things like look up a recipe on your Mac, copy the text, and paste it on your iPhone, or copy a photo from an iPhone to an iPad. Using the feature is as simple as copying something on one device, switching over to another device, and hitting "Paste." It can sometime takes a second or two for the copy to register, but it works seamlessly. There are no visual indicators for Universal Clipboard -- it's all behind the scenes. Apple has implemented an expiration for Universal Clipboard, so you only have a few minutes to paste something to another device once it's been copied. After that expiration time, which appears to be about two minutes, cross-device paste stops working and will need to be reactivated with another copy. There are limitations on what can be copied where. 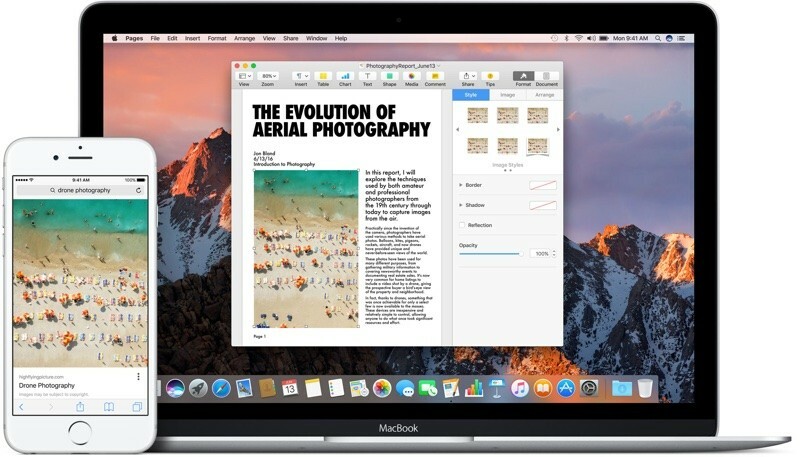 Text can be copied almost anywhere on a Mac or iOS device, but images are somewhat more limited and will need to be copied into an app, like Pages, so it isn't a solid alternative to AirDrop for photo file transfers. Continuity features are sometimes unreliable, and there have been reports about spotty performance with Universal Clipboard during the beta testing period. Sometimes it helps to sign in and out of iCloud to restore functionality, and you'll need to make sure Handoff is activated on your iOS device (Settings --> General --> Handoff). Aside from a Bluetooth connection and the same Apple ID, there are no other requirements. Wi-Fi is not necessary, as Universal Clipboard will work with cellular data. Previously introduced Continuity features allow users to do things like make and answer phone calls on their Macs, get SMS messages on the Mac, and transfer tasks from one device to another with Handoff. Other new Continuity features in macOS Sierra include Apple Pay on the web and Auto Unlock with Apple Watch. macOS Sierra is available as of today and can be downloaded from the Mac App Store. Doesn't work at all for me, and I've grown increasingly unwilling to toggle iCloud off and on every time related features don't work as advertised. As someone who sometimes uses copy/paste for sensitive information (e.g. to copy passwords from a password manager), this makes me very uneasy if true. Does anyone know if this is documented somewhere? I had assumed that the universal clipboard works similarly as Airdrop, which does not upload anything to iCloud (but rather uses a combination of Bluetooth and peer-to-peer Wifi to transfer the data locally). Unfortunately the iOS Security Guide has not yet been updated to cover the universal clipboard. Bluetooth? I though it worked via iCloud. O well, I'm not turning on Bluetooth. I'm glad it doesn't use iCloud... I don't want everything I copy to be sent over the internet immediately. sounds like a nightmare. More exotic new features that work "seamlessly" as long a you wait a few seconds, but not too long, and re-sign in when it doesn't work. I miss the days when Apple took time to ensure solid operating systems instead of constantly moving on to the next new feature. This is the feature I have been most excited for with Sierra. If it doesn't work for you, try resetting your iPhone and restarting your computer. Once I did that, it worked flawlessly. I'm really digging it! It doesn't work for me and I'm afraid of resetting my phone. What does resetting my phone mean? Do I have to restore all apps and data if I do that? Seems like a dangerous thing to do. And under the general iPhone settings, there are maybe 5 different reset options. Which one do I chose, "Reset All Settings"? Simple turning on and off the phone did the trick. It's working now. Glad I didn't reset and create havoc! I already use Notes.app for this. It is more flexible - can paste/copy multiple separate items and they appear almost instantly on all devices. What is the advantage of the new cross-device clipboard feature over the existing functionality of Notes.app? For me it works copying on Mac and pasting on iPhone but not the other way round. it seems to work the same as hand-off. no internet connection is needed. only that there is proximity for a BT connection and that the devices are on the same network (wifi or ethernet). this works even if the network the devices are connected to does not have access to the internet.